Amazon.com has expanded its Prime Now one-hour deliveries to include groceries, meals and baked goods from local stores in New York, in a move that will soon be extended to other cities. The deliveries will be available in some Mahattan neighborhoods starting Thursday, and then expand across the island in the coming weeks. The Prime Now website lists 11 zip codes where residents can use the service. Amazon will add local stores in other cities soon, it said. The first batch of stores are D'Agostino, Gourmet Garage and Billy's Bakery, and Eataly and Westside Market will be the next, according to Amazon. Prime Now and the Android or iOS apps people use to shop were announced in December last year. The service is also available in Atlanta, Austin, Baltimore, Brooklyn, Dallas and Miami. It can be used from 6 a.m. to midnight, seven days a week. 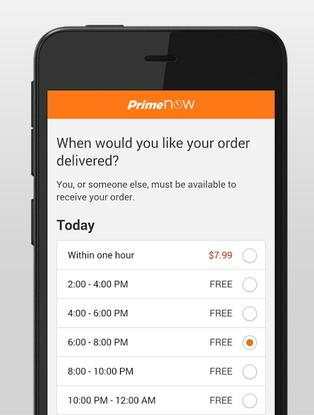 Two-hour delivery is free and one-hour delivery costs US$7.99. As the name implies, users first have to sign up for a regular Prime membership to use the service, which is priced at $99 a year. The local store launch illustrates Amazon's voracious appetite for expanding what and how people buy stuff on its web site and apps. Earlier this year the company announced the Dash button, which lets users buy household goods such as detergent and toilet paper at the press of a button. When it comes to quick deliveries, Amazon isn't the only interested party. Car hailing companies such as Uber and Sidecar also want a piece of the action. Google offers same-day or overnight delivery from local stores with its Express service. And like Amazon, Google is continuing to experiment with drone delivery. Although Amazon already has an extensive warehouse network outside the U.S., it didn't say anything about plans to offer one-hour delivery in other countries.